At Greener Lawns, we strive to create lush, green, and safe lawns for our customers with that same enduring quality. Imagine the joy of spending time with your family knowing your lawn has been treated with only the safest methods available. 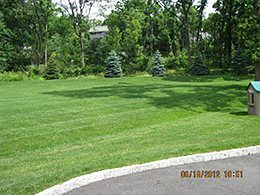 While some organic lawn care companies use only organic fillers and harsh chemical fertilizers that can cause lawns to be compacted and stressed from residual salts, we take a natural approach to caring for the lawns of Basking Ridge New Jersey. Our treatments emphasize natural organic fertilizers and nutrients, which allow your lawn to flourish with a lush green glow. Treat your lawn to the best in Basking Ridge organic lawn care services. Call us today at 908-647-4587 to speak to one of our lawn care experts and request a free estimate! Are Our Basking Ridge Organic Lawn Care Services Right for You? For nearly five decades, owner Joe Serina has been developing and producing our organic fertilizer and nutrient blend, specifically with the unique challenges that come with providing organic lawn care in Basking Ridge, NJ in mind. This has led us to develop a program that works better than any chemical fertilizing regiment on the market. Combined with our tireless dedication to customer service, you too will see why our customers rate our service second to none! Are you curious to see what our Basking Ridge organic lawn care treatments can do for your lawn? Our photo gallery is filled with the amazing transformations we have made for families like yours. See the difference our treatments make and imagine the feeling of soft luscious turf under your feet. The secret to the enduring quality we offer comes from using 10 distinct natural ingredients in our organic fertilizer, while other companies use only 2 or 3. Not only are all of our organic ingredients completely safe, 7 of them are commonly found on the average kitchen counter. We are confident that once you try our services, you will join our growing number of satisfied customers, which is why we are proud to offer free estimates for our Basking Ridge organic lawn care services! If you have always wanted a beautiful green lawn without the harsh, harmful chemicals that often go with it, choose Greener Lawns. We love seeing the satisfied smiles on our customers’ faces after seeing the difference our Basking Ridge organic lawn care services can make for their lawns. Imagine the memories and traditions you could form with your own family. Do not wait, call us at 908-647-4587 today to receive your free Basking Ridge organic lawn care estimate!